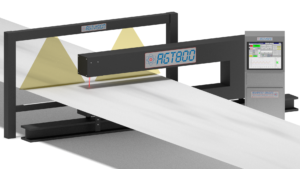 AGT800 Width is a strip width, edge detection and strip centerline measurement system. It is available as a standalone unit or as an option for new and existing A.G.T. gauges. This system mounts independently of the gauge C-frame and connects to the gauge’s electronics cabinet. AGT800 Width can also measure strip off-center position and detect edges. This allows the system to alert an operator when the material is skewing to one side. An analog output can be used in coordination with a strip steering control system to correct strip skewing. AGT800 Width can help processors reduce cost, increase efficiency and improve their ability to compete in an increasingly competitive marketplace. *Some existing gauges may need a computer upgrade to accommodate the addition of the AGT800 Width system. 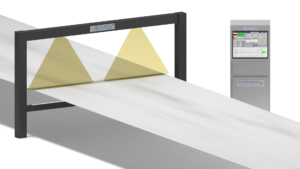 The AGT800 Width system configuration provides a very reliable platform for strip width, strip off-center measurement and S.P.C. reporting. The AGT800 Width Measurement System can be mounted freestanding on the floor or on existing building support structures.